Click here for Nomenclature in Palaeopathology by Keith Manchester, Alan Ogden and Rebecca Storm. Concern for consensus and accuracy in the use of terms in paleopathology has been a longstanding concern for the Paleopathology Association. This issue arose frequently in the popular workshops that Don Ortner presented to the PPA membership at the North American annual meeting, beginning in 1985 and partnered with Bruce Ragsdale, starting in 1989 (Powell, 2012). Ragsdale and Ortner, seeking to bring attention to the topics, as well as input, published the following in the June 1992 issue of the Paleopathology Newsletter (No. 78, p. 7f.). As the inaugural editor-in-chief of the IJPP, I fully endorse the need for attention to terminology, recognizing that ambiguity exists in disease study, notably in the classification of diseases (cf. Ragsdale and Lehmer, 2012 vs. Ortner, 2012). As the IJPP began (2011), I encouraged Don, Bruce, and Keith Manchester to expand upon the earlier effort. Keith, ably aided by Alan Ogden and Rebecca Storm, with input widely invited from across the paleopathology community, has produced this document, entitled “Nomenclature in Palaeopathology.” The authors wish it to be widely shared and to be organic, growing with the field. Comments are actively invited! The “structured lists’ of terms have been appended to recognize the terminological diversity that cross-cuts our interdisciplinary field. As a bioarchaeologist, I would like to call attention to #12, a list of terms drawn from taphonomy. One finds here such terms as “abrasion,” “cracked,” and “wear.” Individuals who chose to use these words in reference to paleopathological structures should be clear in their choice of adjectives: pre-mortem, peri-mortem, or post-mortem. Keith, Alan and Rebecca, THANK YOU for this generous effort. Don and Bruce are also to be recognized for their pioneering efforts. We look forward to your reactions and your careful usage of correct nomenclature. A Companion to Paleopathology, pp. 260-267. Wiley-Blackwell. Powell, Mary Lucas (2012) Donald J. Ortner (1938---). Chapter 11 of The Global History of Paleopathology: Pioneers and Prospects, Jane E. Buikstra and Charlotte A Roberts, eds., pp.89-96. Oxford University Press. 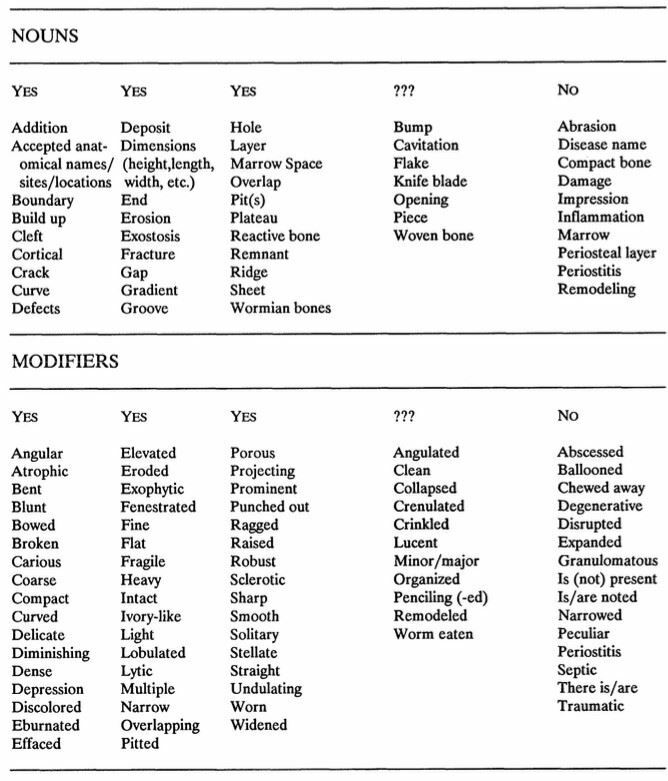 Ragsdale, Bruce D. (1992) Task Force on Terminology: Provisional Word List. PaleopathologyNewsletter 78, pp.7-8. Paleopathology Association. Ragsdale, Bruce D. and Larisa M. Lehmer (2012) A Knowledge of Bone at the Cellular (Histological) Level is Essential to Paleopathology. Chapter 13 of A Companion to Paleopathology, pp. 227-259. Wiley-Blackwell.